Are you a person who is seeking jobs in the banking sector? Or the person with good marketing skills and looking for marketing jobs? Here is a wonderful opportunity for you! 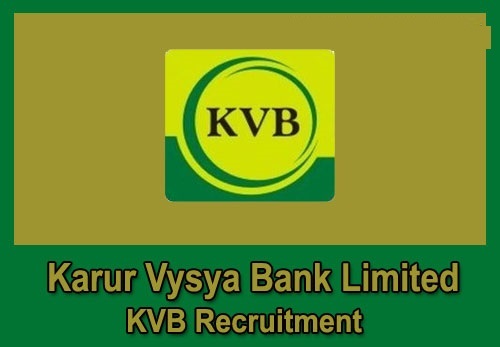 Now you have Karur Vysya Bank Recruitment 2019, the bank has opened its recruitment for the vacancies of the business associates. If you hold a degree, lie between the age of 21 to 28 years and interested in the field of marketing, you may apply for the post. Just log in to the official website of the Karur Vysya Bank and click on the career option, you will find the links to know about the jobs, open and read them completely when you are eligible and interested to apply you may apply for the job. To apply, proceed with the link and fill the required details, upload the necessary documents and finish the registration. Make sure that you have given the valid and right mail ID because the later communications will be through your mail ID only. The education qualification for applying for the post of KVB Business Development Associate Recruitment 2019, the candidate must have completed Under Graduate Degree from the recognized board of university and with at least 50% of marks. The candidates holding degree through corresponding or open university is not eligible. It is necessary for the candidate to be conversant with the local language that has to be placed and also should know to speak in the English language. The candidates should possess a valid driving license and should have a two-wheeler license with his name. It is highly preferable if the candidate has one year of experience in sales of BFSI products. The selected candidates will be appointed in Karur Vysya Bank on the contract basis of 03 years. The salary will be on a consolidated basis of Rs. 18000/- onwards. The candidate is also eligible for performance-based incentives on a monthly basis. The increase in salary will be based on the place and experience. Step 1: Visit the official website of Karur Vysya Bank, www.kvb.co.in and click on career page. Step 2: Now click on Recruitment of Business Development Associate- “Instruction to the candidates”, read them carefully. Step 5: It shows you the list of recruitment available in KVB, look for Recruitment of Business Development Associate and click on apply. Step 6: Register if you are the new user and continue with the registration process. Upload all the necessary documents and submit them. Step 7: You will receive further information through the registered mail regarding KVB Recruitment 2019, be updated in them. The candidates who are qualifying in the online psychometric tests will be called for the personal interview and the cut off marks will be based on the norms of the bank. The posting will be based on the vacancies, if there are vacancies in the hometown, the candidates can be placed in the placed that they wish to work.